We love dogs. Their companionship, loyalty and goofy antics bring us smiles. The photo featured for this post was submitted by one of our military heroes, Chrissy (former U.S. Marine), and it shows her along with her dog, Cactus. She also shared how Homes for Heroes was able to help her with a home in the past, so upon receipt of her photo, I asked if she would be willing to answer a few questions from a fellow dog-lover about her relationship with Cactus. Lucky for me, she agreed. So, in honor of National Love Your Pet Day on Saturday, February 20th, we offer a glimpse into the loving companionship between Chrissy and Cactus. Q: Tell me about how you met Cactus, and please elaborate on the early years. A: I met Cactus at a farm in upstate NY when he was less than two months old. Cactus was the size of a kitten and cute as a button. Our relationship was meant to be and reinforced early on, as Siberian Huskies are born to run, pull sleds, and escape. About once a year, Cactus would sneak out a garage door, climb over and out a door on a second story deck, or find an opportunity to squeeze through a cracked door … then he would take off running! The scene was always the same; a big fluffy white tail bouncing through a field somewhere in the continental U.S. with a slightly concerned, yet proud owner chasing him for miles. Anyone that has ever lived with Cactus, has also chased Cactus and felt that gut wrenching dread, when you realize – Cactus has escaped! Every bit of our life was “Cactus-Proofed” to prevent future escape and evasion, but he would always find a way to go for a run. On my deployments, I would send my dad gym clothes – not for going to the gym; but for chasing Cactus! Q: What was it like for you and Cactus when you returned from being deployed? A: I always enjoyed returning home from a field exercise or deployment to reunite with Cactus. He would be so excited to re-unite with me that he would jump up to my shoulders and give me kisses; then roll over and ask for lots of belly rubs! Q: The photo you sent us is pretty powerful. For me, I can sense your release of emotion, even though we cannot see your face because its buried in Cactus’ fur. If you would, briefly describe how you were feeling leading up to the big Cactus hug in the photo. A: After returning from my final deployment, I was succumbed with an overwhelming feeling of being back in America. About 70 Marines filled a parking lot; looking for loved ones. Cactus saw me and began jumping with excitement. Before I could even make it to my human family; Cactus bombarded me with hugs and kisses. I put my head on his and gave him lots of hugs and kisses in return; we were both so excited to have each other in our lives. Knowing it was my last deployment made this an extra special moment. Q: What made Cactus a trooper, a warrior companion? Q: If you were to explain Cactus in one word to those of us who didn’t know him, what would it be and why? A: That’s easy – Buddy – Cactus was my buddy. And, he was a buddy to everyone he met bringing joy and love to all he crossed paths with. 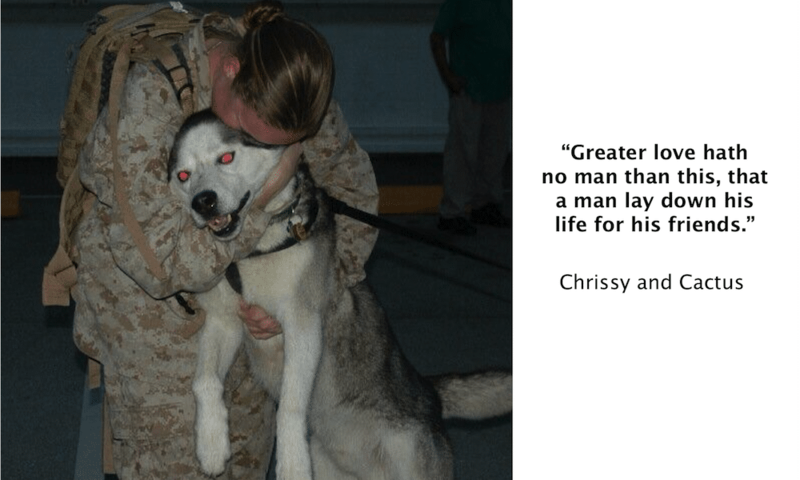 Chrissy, I want to thank you for taking the time to touch on the life you shared with Cactus; what he brought to your life and many others, and for allowing us to share it with our heroes and affiliates. It was a true honor. I like to believe Cactus had a wild spirit due to his tendency to escape and explore, but he knew where home was (whichever home that was), and how much you and others meant to him. I’m confident I would have enjoyed time with him as well. I also want to thank you from all of us at Homes for Heroes for your committed service to our country with the U.S. Marine Corps, and for giving us the opportunity to say thank you directly to you by allowing us to provide you with savings on your home. Thank you Chrissy! Couldnt imagine the heartache of having to leave behind your buddy while protecting our country. Cactus was such sweet boy, and I loved all of the stories you would share at work! I too remember a day when you had to leave to go find him on one of his adventures! What true love and bond is about. Thank you for your dedication to our country. Semper Fidelis, Chrissy and Cactus. Stay motivated!